Some people tell us that Darwinism is just a biological theory, and try to give the impression that it is something that just scientists and academicians examine. Not hardly! Evolutionary thinking has many facets, affecting society at many levels, many of which people may not realize have a Darwinian basis. 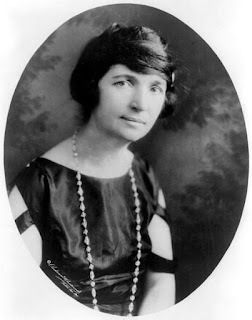 Many know that she was the founder of the for-profit abortion mill called Planned Parenthood (not much of a surprise, since she was a lousy mother to her own children), but there is more to her than is known to the general public. To use the medical term, she was really messed up. Sanger was into "free love" (there's a word for women like that, but I shouldn't use it here), racial purity, elimination of the unfit, and more. The sanitized image of Maggie is presented, and she's a hero to many — unfortunately, even to some professing Christians. Social Darwinism gave rise to eugenics, and Sanger used that "science" as a way to justify abortion. The "unfit" needed to be eliminated, whether through sterilization, abortion, or other ways. Who is unfit? It's up to people who think like her to decide, but you can be sure that they won't believe that man is special and created in God's image. To read the rest of this extremely interesting article, click on "Birth control leader Margaret Sanger: Darwinist, racist and eugenicist". This is being posted on her birthday. I think she won't have any trouble lighting the birthday candles where she is, if you know what I mean.